AGILBERT (AGLIBERT), a Frankish aristocrat who began his ecclesiastical career at the Abbaye Notre-Dame de Jouarre (Jouarre Abbey in the Île-de-France region of present-day France). According to St. Bede the Venerable (25th May) St. Agilbert was consecrated bishop without a See before leaving for Ireland where he seems to have spent some time studying. In 650 he was invited by King Cenwalh of Wessex to succeed St. Birinus (3rd December) as the second Bishop of Wessex, with his See centred at Dorchester-on-Thames. Disputes with the King over the territory of his See and St. Agilbert’s limited command of the local tongue led him to flee north it would appear to Northumbria. There he is said to have ordained St. Wilfrid (12th October) to the priesthood at Ripon and accompanied St. Wilfrid to the Synod of Whitby where they advocated for the adoption of Roman practices. Not long after the Synod, St. Agilbert returned to Gaul where he took part in the episcopal consecration of St. Wilfrid, and soon was elevated to the See of Paris (circa 666–668) St. Agilbert served as Bishop of Paris until his repose circa 679–690, and was buried in the crypt at Jouarre. ANSILIO, (Seventh Century), a monk at the Abbey of Saint-Pierre de Lagny in present-day Lagny-sur-Marne (about 28 km / 17 mi east of Paris). Nothing further seems to be known of him. BRUNO, The youngest son of King Henry I the Fowler and St. Matilda (14th March), and brother of Emperor Otto I the Great. He served as Abbot of Lorsch and Corvey, where he restored monastic observance before he was consecrated Archbishop of Cologne in 953. Soon after was made Duke of Lorraine by Otto. St. Bruno was a zealous pastor whose episcopate marked a new age in the city’s growth — spiritually, scholarly, and physically; many of the next generation of German ecclesiastical leaders were educated at Bruno's court, and he not only extended the then cathedral to the point where it was said to rival St. Peter's in Rome, he built churches and founded the monastery of St. Pantaleon at Cologne. St. Bruno reposed in 965 whilst on a mission to Reims, and was buried at the monastery of St. Pantaleon. EMILIAN, (Date Unknown), according to pre-2001 editions of the Roman Martyrology St. Emilian was a hermit in Rennes, however, there is no local record of his existence. ETHELBURGH (ETHELBURGA), an East Anglian Princess who followed her brother St. Erconwald (30th April) into monastic life and served as the first abbess of the double monastery at Barking, Essex. St. Bede the Venerable (25th May) writes of many miracles which took place at Barking during her time as Abbess. Shortly before St. Ethelburgh’s repose, St. Thorgyth (25th January) had a vision in which she saw a body wrapped in a shroud, shining with a bright light. As she watched, the body was drawn up to Heaven on cords which were brighter than gold. A few days later St. Ethelburgh fell asleep in the Lord (circa 676). EUFRIDUS, a seventh century monk near Asti in Piedmont, whose relics were enshrined in the Cattedrale di San Lorenzo in Alba. Nothing further is known of his life. FIRMINUS (FIRMIN) of UZÈS, a native of Narbonne in southern Gaul. Educated by his uncle Roricius, the third Bishop of Uzès, St. Firminus served as fourth Bishop of Uzès, from 538 until his repose in 553. His relics are enshrined at the Cathédrale Saint-Théodorit d'Uzès. GERMANUS of BESANÇON, (Fourth Century), an early Bishop of Besançon in Gaul, there are no reliable details of his life extant, but it appears certain that he was martyred by heretics (probably Arians) towards the end of the fourth century. GRATUS (GRAT), the first Bishop of Oloron in Aquitaine, it is believed he took part in the Council of Agde (506), reposing later that year. GUMMARUS (GOMER), a son of the Lord of Emblem (near present-day Lier Belgium), member of the court of Pepin the Younger, and later soldier. St. Gummarus married a young noblewoman who turned out to be a cruel and capricious harridan, abusive to servants and tenants. This behaviour weighed heavily on the deeply devout St. Gummarus, and in time he and his wife separated. St. Gummarus became a hermit at Nivesdonck, and soon attracted disciples. The area around his hermitage grew into present-day Lier. St. Gummarus reposed circa 774. JULIANA of PAVILLY, a servant girl who received monastic tonsure at Pavilly Abbey in Normandy, where she was a spiritual child of the Abbess, Benedicta. 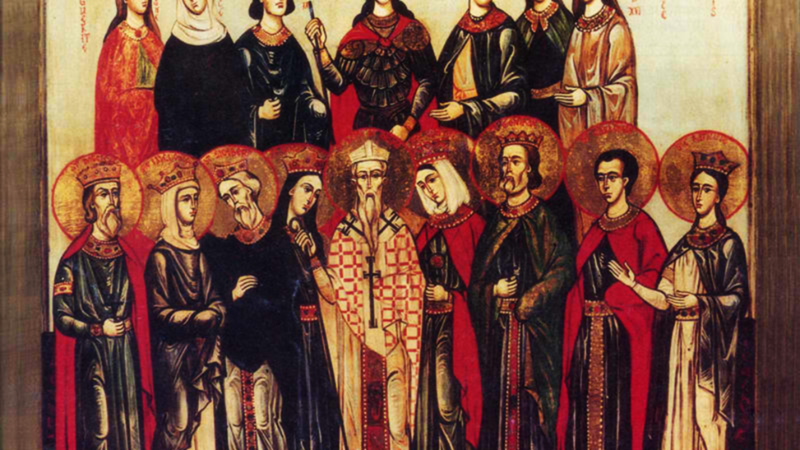 Upon Benedicta’s repose, St. Juliana was unanimously chosen to be the Abbess. St. Juliana reposed circa 750. KENNETH (CANICE, CAINNECH, KENNY), most of what we know of St. Kenneth is based upon legend., however, it is possible to glean a few facts from the Vita Columbæ by St. Adamnán of Iona (23rd September) in which he makes multiple references to St. Kenneth. St. Kenneth was born in present-day Co. Londonderry, and went to Clonard Abbey to study under the great ‘Teacher of the Irish western-saints’ St. Finian of Clonard (12th December), with the group that came to be known as the ‘Twelve Apostles of Ireland’. He then went on the study at Glasnevin under St. Mobhi (12th October). When plague forced that community to disperse, St. Kenneth went to Wales to be a monk at Llancarfan under St. Cadoc (24th January). In time, St. Kenneth went north to assist in the evangelisation of the Scots. In Scotland he built the first church in what is now St. Andrews, and earned such respect amongst the Scots that he is one of the three favourite Irish saints in Scotland (along with SS. Bridget (1st February) and Columba (9th June). St. Kenneth the returned to Ireland where he founded several monasteries on lands granted to him by the local king. His primary establishment was the monastery and Abbey of Aghaboe (in present-day Co. Laois) of which he served as Abbot. towards the end of his life, St. Kenneth retired to an island in Loch Cree (long since drained) where he wrote a commentary on the Gospels, which came to be known as the Glas-Chainnigh or Chain of Cainnech . St. Kenneth reposed and was buried at Aghaboe, towards the end of the sixth century at the age of eighty-four. He is the patron saint of Kilkenny, Co. Kilkenny, Ireland. PLACIDIA, there is no verifiable information on St. Placidia extant, however according to tradition she was a holy virgin who lived in Verona in the mid-fifth century, reposing circa 460.